Calum Scott reveals which of your favourite tracks you have been voting for. Radio 1's Greg James unwraps the brand new Official Chart. Browse content similar to The Playlist with Calum Scott. Check below for episodes and series from the same categories and more! and my co-host Lauren Layfield. to appear on another episode of The Playlist. I would climb every mountain. from, like, Greg James or Steve Backshall, or someone. That is dedication to The Playlist. ..just to be with you. What, I'm the reason you're on The Playlist? Oh, no, I was just singing lyrics to my new single. when he first heard him sing. This week's Playlist host is Calum Scott. So, Calum, somebody said you've got a new friend. Are you quoting my lyrics back to me, there? -No, I was just introducing you to Greg James, there, look. Sorry, Greg, what are you doing there, mate? Dancing on my own. The song you covered. That... That's not the name of my new single. Oh, don't worry about all that. Anyway, here's the chart. Brand-new into the top 10 this week it's Zedd, Grey and Maren Morris. Justin thought he was quite good, so he kept him on it. This is Kendrick Lemar and SZA with All The Stars. after working on a track with Kanye West, this is Psycho. showing off her incredible voice. when they bumped into Dua Lipa. Anne-Marie and Marshmello really are friends, actually. and eating doughnuts together in LA. to ruling in the UK charts. This is the Feel It Still. performing These Days at every stop along the way. This is Rudimental, Jess Glynne and Macklemore with These Days. but will Drake win this week's Playlist? Now, I won't be here next week. Um... I've been sacked. Radio One's official chart is on the radio every Friday at 4pm. So, listen to it then. BEEP Nice fist bump, Greg. see you in May, mate. May. We're not back till May. Lullaby, Sigala and Paloma Faith. Let's find out who you voted in the third place. A brilliant first track, there, you guys. Your second place and your winner still to come. You've been choosing so well! Are you ready to face defeat, Layfield? What are you doing, there? OK, the rules are simple. and you've got to think of a song with that word within. First one to race to the mic and sing said song wins the point. -Why would you run like that?! I think it's an old one. Great dance moves, there. Great dance moves. Maybe I should do this bit. It's my second time as host. Let's find out who you voted for in second place. # She say, "Do you love me?" I tell her, "Only partly"
and we've got your winner still to come. skip, skip, skip.... Skip a beat every time we see him. It's the man with the voice, Olly Murs. I'm Olly Murs. I'm here for The Voice auditions. Oh! The Voice auditions, yes. Yes. That is what we're here to do. I mean, you know, you have to write into the show, you know. What songs you're going to do, what you're going to tell the coaches. No, I'm here to do the audition for The Voice coach. Tell me what do you think would make you a really good Voice coach? lots of experience and help them along this amazing journey. -Yeah? OK. Anyway, I'll see. Do you have any experience in the music industry? I've been doing it now, probably, the last nine years. It's been an amazing nine years. Learnt so much. Done so much. Moving on with the audition, because that's what we're here for. Enough about listening to you talk about your career. Oh, you're so great(!) Ooh(!) So, would you say you've got The Voice? I'd say I've got The Voice. Oh, you want it... Sorry. I didn't mean to be rude. Well, prove it. You said you can sing. What would you sing if you were to audition for the show? I'd do Man's Not Hot. Man's not hot. Never hot. One plus one is two. Two plus two is four. Minus three equals quick maths. Man's not hot! Never hot! -You can catch the whole thing online on the CBBC website. Me too. Always ready for a race. This isn't... It's not a race. The next bit's not a race, mate. I just always wear this. -So, Calum, you are a massive fan of the show, right? And you watch every episode on the CBBC iPlayer, right? Right. Here we go, remember you can play along at home. -There we are. Jonas Blue. -There he is. On a little trike, or something. -Looks a bit too big for it. -Why is Jonas Blues sitting in a tiny car? Is it because, A, he's got a fast car? and Jonas Blue's just really tall? Just a big, giant Jonas. -Or, is it, C, he's learning to drive? but maybe he's just eluding me. -So I going to say he's learning to drive. He's got a Fast Car. I'm not very good at this. -The name of his single. Why is Greg James perched on a chair? Is it because, A, the floor is lava? Is it because, B, he's scared of mice? Or is it, C, it's a new Sport Relief challenge? It looked like one of those Tom and Jerry sketches. -So I think he's scared of mice. -Incorrect. The floor was lava! There he is, lovely little HRVY. -A little bit Zen there. -Is it because, A, he's showing us his best vocal warm up? -Or is it, B, he is teaching us how he relaxes before a show? Or, C, he's forgotten the words to Personal? I think it might be his warm-up technique. and two guest appearances from me! -Right, Lauren, enough of the challenges. No, I've just got my car on a parking meter. -It's time to announce the winner. -It's that time of the week. -It's what you've been waiting for. Bigger than the biggest ever big thing you could ever imagine. Congratulations on another amazing winner this week. which means there'll be no vote. No, no! All right, cool. So, action! I'm just, like, jamming it out! for hosting The Playlist again. -I've just released my album and it's gone global. And I'm going on tour. -for the very first time, so I'm very excited. and catch up on some big name clips as well. Same time next week for The Playlist? No, actually, have you forgotten? -We're going on holiday for a few weeks. Yeah, we are. I can't believe you've forgotten. But, don't worry, I've packed you a little bag. 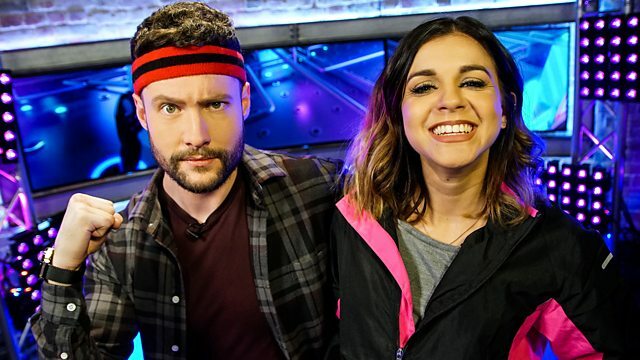 Calum Scott is back to host another Playlist. He reveals which of your favourite tracks you have been voting for, Races Against the Mic with Lauren, and proves how much he knows about his favourite TV show - The Playlist! All of this, and Olly Murs auditions to become a singing coach and Radio 1's Greg James unwraps the brand new Official Chart.